Commonly referred to as “Nature’s candy,” raisins are in steady demand and are especially popular with the health food industry and choice bakeries. Raisins are widely used in cuisines around the globe and are a heart-healthy snack rich in potassium and soluble fiber, which reduces LDL (“bad cholesterol”). Kids love them (even the picky eaters) alongside active people (hikers, bikers, runners) in need of a quick burst of energy. Red River imports four varieties of raisin- Flame, Thompson, Golden, and Crimson from various origins including California, Chile, Argentina and South Africa. We offer both conventional and organic raisins. Thompson raisins are brown and oblong shaped with a tough skin. The sizing on Thompson variety raisins is typically a midget, a medium, and a jumbo. Medium is referred to as “select ” size in California while all other origins use the term “medium” for sizing. Thompson tends to be cheaper than most other varieties on the market. They are the ideal variety for using in bread, bagels, cookies, single snack packs, or to coat in chocolate. Flame raisins are large, black and sweet. They are a little softer and meatier than Thompson raisins. This is the ideal variety for snacking raisins or to add in a trail mix. Golden raisins are slightly more tart in flavor. They are used in trail mixes, breads, and as a stand-alone snack. They get their name from their yellow color which is a result of added sulphur dioxide. Similar to apricots, their natural color is brown until they are treated with sulphur dioxide which results in a bright yellow coloring. 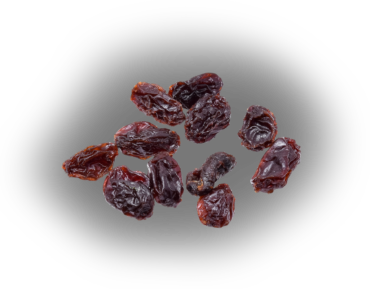 Crimson raisins are a newer raisin variety that is comparable in color to a Thompson raisin. They too have an oblong shape. Their skin is tougher than a Thompson. They are the least expensive variety.